Things you don’t think about when you’re pregnant (at least I didn’t). And to think I now look back and am convinced I had some sort of chemical mood disorder that first time I was pregnant (yup, I wrote about it in a book). According to the Center for Disease control (CDC), postpartum depression affects 1 in 7 women (some numbers say 1 in 5 when you consider the broad spectrum of anxiety as well). Postpartum care begins with education and discussion — and there’s a new documentary that follows the raw and real stories of three (famous) Southern California women. I interviewed one of them on my CBS Los Angeles Facebook video chat (fabulous open discussion). We get stronger with conversation, education and frank-and-fearless talk. Speaking of being strong, there’s social media stir bringing support, awareness and activism called #PostpartumStrong thanks to our friends at Santa Monica’s Pump Station & Nurtury. Take a picture of your strong muscle, post it to social, tag #PostpartumStrong and CHALLENGE SEVEN FRIENDS to do the same (because, 1 in 7 women experience postpartum depression). Visit WeArePostpartumStrong.com. CBS Los Angeles: Motivation for Multi-Tasking Moms. 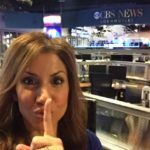 CBS Los Angeles: Best Revealing Questions to Ask a New Sitter. Related: New Mom Style: No more slutty shoes.